Brad Bannon writing in the USnews.com web site has an interesting opinion on why there are political problems on Capitol Hill in the US between President Obama, the Senate, and the House of Representatives: "Hate Political Gridlock? Blame It on the Boomers". Baby Boomers are people born between 1946 and 1964 (that makes me a baby boomer! ), and Bannon points out that they "currently dominate American politics" - by (my) extension they do in the rest of the world as well. He says that the baby boomers are to blame for the polarization that exists in American life and politics. 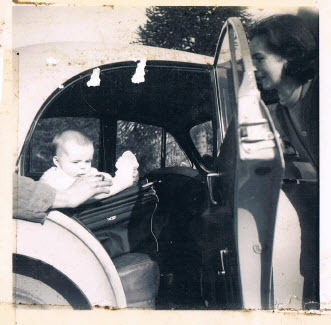 as a baby (boomer) in 1960. There is a very simple reason for this according Bannon: "The boomers grew up in the world of black and white television and a black and white culture with no shades of grey. They lived in a world where there was a right way and a wrong way to do things. For boomers, it's their way or the highway. The boomers grew up during the the Vietnam War and the assassination of two Kennedys and one King. Conflict, not compromise, goes with the territory". I never thought of it that way! My Mum always said that watching too much telly was bad for me. So I guess that all those kids my age watching TV in the 1960s and 1970s were sowing the seeds of political stubbornness that would grow 40 years later. The Monkees, Wanderly Wagon, and The Waltons have a lot to answer for! Maybe we are to blame for everything? But don't worry - the "millennials" (those born between 1982 and 2003) are here to save the world because they "grew up in a world of color TV"!